Epiphany’s Cardio Server was the top-ranked solution for ECG Data Management in the “2010 Top 20 Best in KLAS Awards: Software & Professional Services” report. All of us at Epiphany are honored by the KLAS recognition as the top-ranked solution for ECG Data Management. Our inspiration comes from our commitment to matching our customers’ needs with superior performance. Epiphany Cardiography Products, LLC is proud to announce our 2010 recognition from KLAS. Epiphany’s Cardio Server was the top-ranked solution for ECG Data Management in the “2010 Top 20 Best in KLAS Awards: Software & Professional Services” report. According to Joe Noto, VP Sales and Marketing at Epiphany, “the KLAS reports are a powerful tool we use to monitor our customer satisfaction, helping us to continually improve each year. With the reports, we are able to gather information about what areas of our business are successful and what areas need strengthening. All of us at Epiphany are honored by the KLAS recognition as the top-ranked solution for ECG Data Management. Our inspiration comes from our commitment to matching our customers’ needs with superior performance." Founded in 2004, Epiphany Cardiography Products simplifies the collection and management of diagnostic test results. 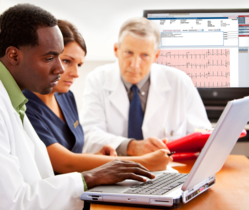 Epiphany’s Cardio Server is a web-based, user-friendly management system application that receives diagnostic test results from over 100 devices and over 30 vendors in 15 diagnostic modalities.